The Green Star GS-1000 Juice Extractor exemplifies why the Green Star line is a standard in the Juicer arena. • It has a 110-rpm turning speed, allowing for more efficient juicing and quieter operation. • It can juice most fruits, vegetables, and other greens. 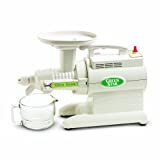 • It can grind grains and nuts. • The 190-watt motor allows it to operate under less strain, which makes it much more durable than other models. The motor is even air-cooled, which prevents it from overheating. • It has a convenient sure-grip handle for easier transport and handling. • It has a five-year warranty. The advantages of the Green Star GS-1000 Juice Extractor are well known among juicer users. • Greater efficiency at producing juices from greens than other models, with pocket recesses which helps in processing harder vegetables such as carrots. These recesses decrease the strain on the motor when processing harder greens. • The twin gears have cutting points, unlike other models with flat gears. This allows the Green Star GS-1000 Juice Extractor to handle a wider variety of greens without clogging or jamming. Some models have auto-reverse technology to interrupt the juicing process should any clogging happen, but with this model such technology is unnecessary. • The twin gears are made from stainless steel with nylon elements. The nylon ensures that the gears will never come in contact with one another, and prevents shavings from entering the juice. The nylon also contributes to the longevity of the motor. It cracks when there is too much strain on the motor. Although this will require the gears to be replaced, gears made purely from stainless steel transfer all the strain to the motor, which can cause it to burn out. The cost of repair for the motor is much more expensive. The best juicer reviews will always mention some drawbacks (if any) as well as suggestions for improvement. No matter how great the Green Star GS-1000 Juice Extractor is, it also has its share of drawbacks. • Although the manufacturer is quite right to point out that the cleanup process is easy—and it is—it is also somewhat time-consuming. Several parts need to be disassembled, and the small screen may require a bit of serious scrubbing. The good news is that the Green Star has a specialty brush for this very purpose. • Like most twin-gear models, it is somewhat more expensive than the less efficient centrifugal models. Many customers are quite satisfied with the basic performance of the Green Star GS-1000 Juice Extractor, when compared to other models in its price range. However, every now and then a Green Star GS-1000 Juice Extractor review will note that high end Green Star Models, although more expensive, may be worth the price due to their more advanced accessories. In a word, yes. Although the manufacturer markets this model as a “basic” version, it has much more advanced features and advantages than other similar products in the market.